Advanced Banner Slider is highly professional and eye-catching banner. Most of customers coming to an online store and pay attention to banners first. Banner Slider is most effective way to show a series of your images, content, and call to action button. It is an effective tool for advertising to get user’s attention on your site. This module includes unlimited banner sliders, multiple slider styles, easy configuration, sort order of banners, short-code for CMS/HTML Editor and many more. Easy to use and Intuitive interface. 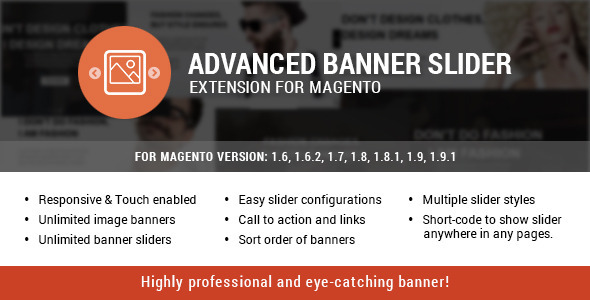 Advanced Banner Slider Extension does not overwrite any Magento core files. Work with custom templates.